Riding a brilliant tower of flame into the night sky, the space shuttle Endeavour left Earth on Friday, carrying seven astronauts on a 15-day mission to the international space station. Space shuttle Endeavour lifted off at 7:55 p.m. ET on Friday, en route to the international space station. 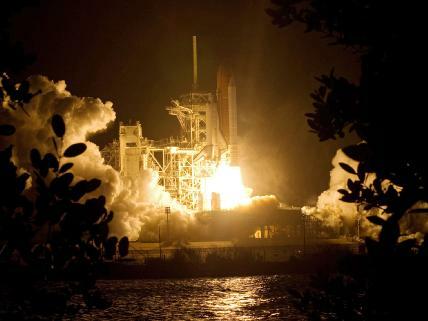 The space shuttle Endeavour launched on time at 7:55 p.m. ET on Friday from the Kennedy Space Center in eastern Florida, mission managers announced. "Preparing our home in space for a larger international family," launch commentator Candrea Thomas said during lift off. The 15-day flight's primary goal is to update the international space station so it can house six crew members at a time comfortably, instead of the current three. Watch the space shuttle Endeavour's lift off. Additions to the station's living space include more places to sleep, another bathroom, a better water system, new exercise equipment and a bigger refrigerator. Four spacewalks are also scheduled to repair and service the station's two Solar Alpha Rotary Joints, which enable the station's solar panels to track the sun. The shuttle is also bringing Thanksgiving dinner, with irradiated turkey, candied yams, stuffing and dessert, because it won't be returning to Earth until November 29. 1. How many astronauts are there in the shuttle? 2. How many days will they be in space? 3. How many crew members can currently live in the International Space Station? 4. What’s the main goal of this space mission? 5. Which facilities will be improved or replaced in the International Space Station during this mission? 6. Name 4 things they are taking with them to celebrate Thanksgiving. 7. How many spacewalks will they take and what for? This page was created by Isabel Perez using Web Poster Wizard.